‘Tis the season for love and innuendo. The commercially driven Cupid-inspired Valentine’s Day is nearly upon us and shops nationwide have certainly got the memo, with countless store fronts strewn with pink and red tat. Marks and Spencer, the nation’s most trusted stockist of twinsets and purveyors of iconic advertising, is no exception. Getting into the spirit of things, the posh supermarket wants you to try its love sausage – and shared an unsolicited love sausage pic to Twitter to prove it. Are you ready for our Love Sausage? It went on to encourage the general public to ‘say it with sausages’ and tag who you’ll be sharing your ‘love sausage’ with on the big day – February 14, in case you need a little reminder. …And, obviously, it’s not just any love sausage. It’s an M&S love sausage. Coming (ahem) in at a fiver, the lightly truffled, heart-shaped meat feast comes wrapped in bacon. The supermarket served their sausage up with two eggs, sunny side up, too, and with the obligatory pink plates, rose petals and tea lights. Some of the good, unsuspecting people of Twitter have pointed out the dish might be best served tongue-in-cheek. An M&S employee called Chris, who is posting the M&S Twitter feed today, coyly replied in one of the cheekiest exchanges since your last Nando’s. UNILAD went to the website to see if you could buy the love sausage online – and to get a closer look at the 460g banger’s serving suggestions. 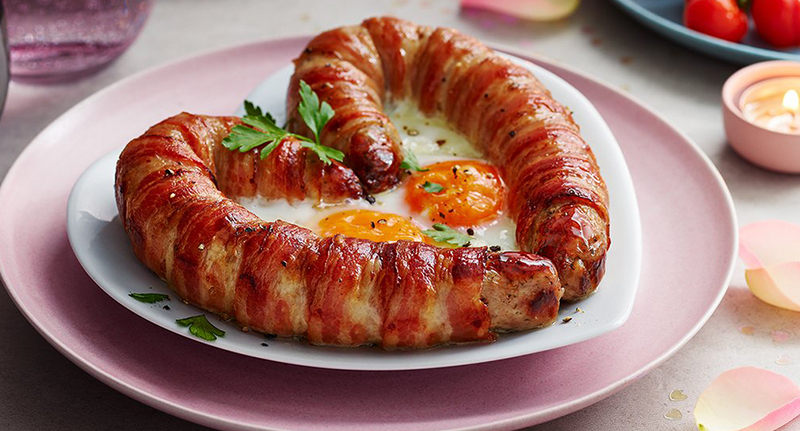 You can get your own bacon-wrapped love sausage in stores from 8 Feb for £5 – but we can confirm the eggs are not included. Holly Brockwell had the same thought, but couldn’t find anything to ‘match’ her search in a harrowing reflection of modern day Tinder dating. Another amused observer noticed it is ‘ribbed for extra sausage derived pleasure’, while another asked if M&S could come up with a ‘love clam’ dish for the women who want to say it with fish, apparently. Aside from the feedback, there have been ‘nudge nudge wink wink’ reactions courtesy of the Carry On franchise a-plenty. What a genius ploy to tug on our heartstrings, funny bones and tastebuds all at once. Clever dicks.